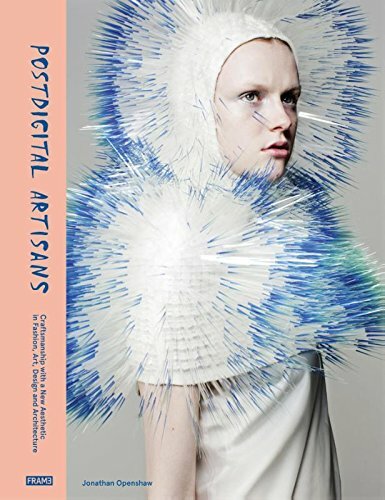 Obtenez le livre Postdigital Artisans: Craftsmanship with a New Aesthetic in Fashion, Art, Design and Architecture par Jonathan Openshaw au format PDF ou EPUB. Vous pouvez lire des livres en ligne ou les enregistrer sur vos appareils. Tous les livres sont disponibles au téléchargement sans avoir à dépenser de l'argent. Digital technology has irreversibly changed how we see, think and act. A staggering number of us spend as much as half our waking hours online. Right now, more people are gazing at a screen than looking out a window. As we are drawn deeper into a symbiotic relationship with the digital, there is also a growing desire for more tactile, immersive experiences. Touch screens don t eliminate the need to touch something more palpable than an electronic visual display. It s in this context that today s "postdigital artisans" operate. Inescapably influenced by the digital world, they nonetheless reject strictly screen-based design and total reliance on automated production, such as 3D printing. They advocate a return to craft, with objects made from clay, metal, glass and wood. They neither turn their backs on technology nor glorify nostalgia, but the high-tech honeymoon is over. They see materials as the heart of art, design, fashion and architecture. Postdigital Artisans profiles sixty contemporary artists and designers, accompanied by rich illustrations of their work. Essays and interviews by and with leading figures such as Hans Ulrich Obrist, Nathan Jurgenson and Glenn Adamson deftly analyze all forms of postdigital creativity, from visual art and design to architecture and urban planning." Digital technology has irreversibly changed how we see, think and act. A staggering number of us spend half our waking hours online. Right now, more people are gazing at a screen than looking out a window. But a deeper symbiotic relationship with the digital does not quash the desire for a tactile, physically immersive experience. Touch screens don't eliminate the need to touch something more palpable than an electronic visual display. It's in this context that today's 'postdigital artisans' operate. Inescapably influenced by the digital world, they nonetheless reject strictly screen-based design and total reliance on automated production, such as 3D printing. They advocate a return to craft, with objects made from clay, metal, glass and wood. They neither turn their backs on technology nor glorify nostalgia, but their high-tech honeymoon is over. They see materials as the heart of art, design, fashion and architecture. Postdigital Artisans profiles 60 contemporary artists and designers, accompanied by rich illustrations of their work. Essays and interviews by and with leading figures such as Hans Ulrich Obrist, Nathan Jurgenson and Glenn Adamson deftly analyse all forms of postdigital creativity, from visual art and design to architecture and urban planning. Digital technology has irreversibly changed the way in which we see, think and act on the world. It s estimated that the Internet now absorbs around half our waking attention, and more people are gazing into a screen at this moment than are looking out of a window. But as we are drawn deeper into a symbiotic relationship with the digital, there is a growing desire for more tactile, immersive experiences. Touch screens are not enough: people want to actually touch, and be touched in return. It s in this context that we should see the postdigital artisans of this book. Deeply influenced by the digital world in which we live, they reject a purely screen-based approach, and warn against a reliance on automated manufacturing processes such as 3D printing. Instead, they call for a return to craft in the digital age, and are making tactile objects from clay, metal, glass and wood. This is not a rejection of new technology, and there is no sense of nostalgia in their work. The opportunities and aesthetics of the digital age are embraced here, but the technological honeymoon is over for these artisans, who place materials back at the heart of art, design, fashion and architecture. Postdigital Artisans profiles 60 contemporary artists and designers, accompanied by rich illustrations of their work. Essays and interviews with leading figures such as Hans Ulrich Obrist, Nathan Jurgenson and Glenn Adamson also throw light on the subject of postdigital creativity, from visual art to architecture, urban planning to design. Jonathan Openshaw: Jonathan Openshaw is editor in chief of POSTmatter magazine, and writes extensively on the impact of new technology on the creative industries. Openshaw studied Social Anthropology at Cambridge, and specialised in the anthropology of art and visual communication.